Hector Arana Jr. earned the top qualifying position as Angelle Sampey went to her first final since 2008 at the Summit Racing Equipment NHRA Nationals in Norwalk, OH. Arana Jr. took the top spot on his Lucas Oil S&S-Powered Pro Stock Buell with a 6.868 at 195.79 mph recorded during Friday’s second session. Chip Ellis, who turned heads at Englishtown, qualifying on the pole as a substitute rider on Junior Pippin’s Pirana-Z Buell, qualified second at 6.880. Matt Smith was the next S&S-powered machine on the final qualifying list, taking the fifth spot at 6.928 on his Nitro Fish Victory Gunner. 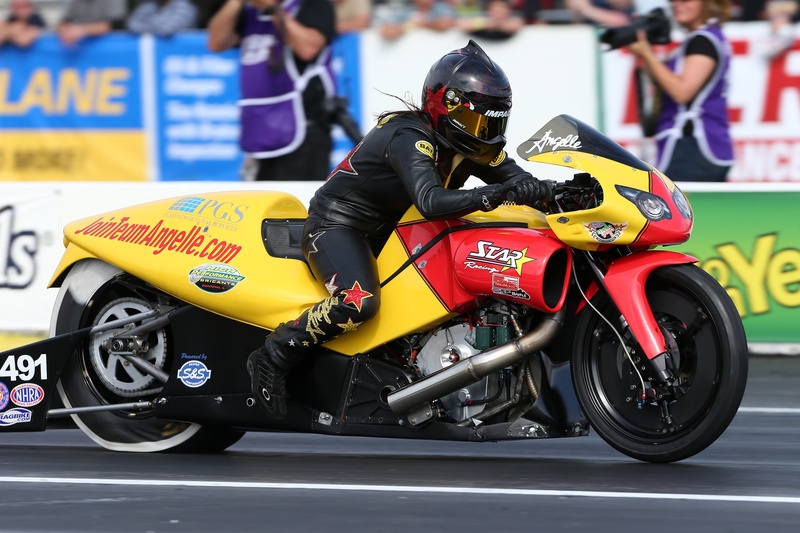 Sampey started in the 14th position with a 7.037 on her JoinTeamAngelle.com Buell. It was Arana Jr.’s second #1 qualifying performance of the season and 18th of his career. 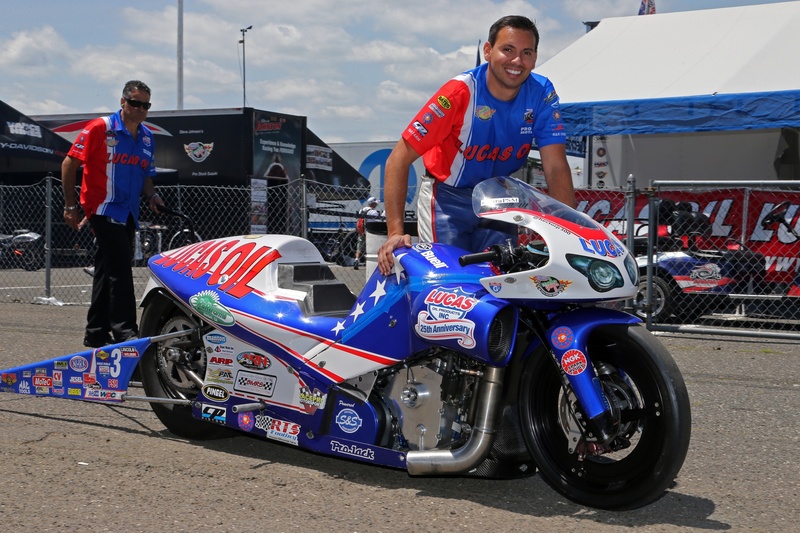 “It’s awesome to be out here racing on this big holiday weekend, and we had the perfect paint scheme for it with our red, white, and blue Lucas Oil bike,” said Arana Jr.
“We have a lot of good history at this track,” he continued, noting that he took his first number one qualifying performance at Norwalk and his father won his first-ever national event win at the track. Eliminations ended abruptly for Arana Jr. as he suffered mechanical problems in round one against Angie Smith. Sampey, on the other hand, came alive in eliminations with a near-perfect .001 reaction time and 6.89 to earn a holeshot victory over number three qualifier Jerry Savoie who ran a 6.88 in the loss. Sampey met Ellis in the semifinals and advanced with a holeshot win, 6.94 to Ellis’ quicker 6.91. That put Angelle in the final against the Suzuki of Karen Stoffer. The last time they met in a final was the last all-female final in NHRA professional competition, the 2002 Maple Grove, PA, event won by Sampey. The final was over quickly as Angelle redlit, giving Stoffer her second win of the season. The next event on the NHRA Mello Yello Pro Stock motorcycle series is the Route 66 NHRA Nationals in Chicago, July 9-12.